Shell is the number one global lubricant supplier to consumers in Malaysia. 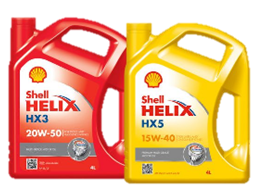 The Shell Helix engine oils are designed to meet your your driving needs. From the first synthetic motor oil designed from natural gas, Shell Helix Ultra with PurePlus Technology, to premium multi-grade oils for everyday driving environments, the Shell Helix range has an oil to suit every engine. JOHO BATERI & TAYAR SDN. BHD. MATRIX SKYPOWER AUTO SERVICES SDN. BHD. SIN BEE SOON HUAT AUTO SERVICES SDN. BHD. FUTURE EMPIRE RESOURCES SDN. BHD. LOO AUTO AUTO PARTS & MOTOR SERVICE CO.